Dr. Allan is a former senior lecturer in genetics at the University of Stellenbosch in South Africa. He holds a B.S. in agriculture from the University of Natal, an M.S. in agriculture from the University of Stellenbosch and a Ph.D. in genetics from the University of Edinburgh, Scotland. He currently serves as an international consultant in the field of dairy cattle breeding. As a biologist in the field of population and quantitative genetics, I had believed in the theory of evolution for nearly 40 years. During that period of my life, the long-time requirements of the theory did not really concern me. Chance (genetic drift) and natural selection in response to gene mutation and/or environmental change seemed to be logically acceptable mechanisms for the assumed extent of adaptive radiation. My research involved using biometrical methods of analysis. I was concerned to predict rates of genetic change as a result of applying artificial selection procedures of varying intensities, based on different kinds and amounts of information. The accuracy of prediction of the rate of genetic change can be assessed theoretically and the results can, in many cases and in the short-term, be checked empirically. The change in genetic merit (and associated phenotypic merit) from one generation to the next is due to changes in the relative frequencies of the underlying genes. Over all those years, because I accepted the “fact” of evolution, I saw no reason to differentiate in principle between changes in relative gene frequency as a consequence of either short-term or long-term natural selection. To me, these forms of selection resulted in just the one simple principle of change in relative gene frequency, and the essence of the theory of evolution is change in relative gene frequency as a result of genetic drift and of natural selection in response to gene mutation and/or environmental change. When, at a fairly advanced stage of my career, I became a Christian I began to read the Bible reverently and as intelligently as I was able. At that time most of my reading was focused in the New Testament and, as my main concern was to know more of Christ as my Savior, my opinion concerning the theory of evolution remained unchallenged. I did not, in fact, give it much thought. One day, after I had been expounding on the universality of DNA as evidence for the theory of evolution, my wife, who had been a Christian much longer than I, asked me whether there was any reason for God to have used other genetic systems. Just one simple question, but it stimulated me to ask myself many more. Was there any reason for God to have created life-forms on the basis of ABC … PQR … and XYZ as well as DNA? Were that so, would it have influenced my belief in the theory of evolution, or would I have interpreted it as a number of independent origins of life? Was there any reason why God should not have created all forms of life as “variations on themes” and so have provided the observed orderly degrees of genetic and phenotypic resemblance as evidenced in taxonomic classification? Relatives tend to resemble one another in physical, functional and behavioral characteristics. This is a phenomenon which is basic to the science of genetics. The resemblance is due to the fact that relatives, sharing in the common gene pool of a reproducing population, have genes in common. The closer the relationship, the greater is the proportion of genes in common and, therefore, the greater is the degree of resemblance. The theory of evolution assumes a common origin for all forms of life and, therefore, infers that species, genera, families, orders, etc. are genetically related. They all do carry some genes with similar structure and function, yes, but did this imply genetic relationship in the normal, within-species sense, and was one at liberty to assume a common origin for all forms of life? Was there any reason why God should have created different species, genera, etc. in completely different ways and with completely different genes? I then felt a need to ask questions of a more scientific nature about the validity of evolutionary assumptions. I present here two aspects arising out of such questions concerning the claimed evolution of man. Cytochrome-c is a protein and is a gene product. It functions as a key enzyme in oxidation reactions and seems to occur in practically every living organism. There are 20 different amino acids. Cytochrome-c consists of a chain of 112 amino acids, 19 of which occur in exactly the same sequential order positions in all organisms tested. Differences in the identity and positions of the remaining 93 amino acids are considered to be the result of mutational substitution during the course of evolution. The amino-acid constitution of human cytochrome-c differs from that of many but not all other species. There are no differences in the cytochrome-c taken from humans and from chimpanzees, and only one difference between human cytochrome-c (the amino acid isoleucine in position 66) and that from the Rhesus monkey (threonine in that position). The numbers of differences in the cytochrome-c of various species compared with that of humans are: cow, pig and sheep (10), horse (12), hen and turkey (13), rattlesnake (14), dogfish (23), fly (25), wheat (35), yeast (44), etc.1 Information of this nature is used to construct phylogenetic trees of assumed genetic relationship. This is presented as evidence for evolution on a molecular level and, among other things, it is concluded that man and the chimpanzee have a relatively recent common ancestor. Assuming for the sake of argument that this is correct, does the constitution of cytochrome-c provide valid evidence for evolution? The fact that cytochrome-c has a fixed number of 112 amino acids is an indication of the importance of the three-dimensional structure of the molecule, i.e., there is a structural constraint on the total number of amino acids. On the other hand, only 19 of the 112 are identical in all organisms tested. Since the identity and positions of the remaining 93 amino acids differ among organisms except, for example, in the case of man and chimpanzee, it is reasonable to conclude that there are no functional constraints on the substitution of these remaining amino acids. Apart from the single gene controlling the constitution of cytochrome-c, humans and chimpanzees differ in many thousands of other genes. As a conservative estimate, let us say 5,000. What the theory of evolution is saying is that while humans and chimpanzees have evolved independently from a common ancestor so as to now differ in these 5,000 genes, there has been no change in the 93 amino acids specified by the cytochrome-c gene, and this in spite of there being no functional constraint on change in any of the latter. I find this to be an unacceptable claim. According to Weaver and Hedrick,2 however, the lack of differentiation in the constitution of cytochrome-c between humans and chimpanzees is due to the very slow (0.3 x 10-9) estimated rate of amino acid substitution in cytochrome-c. How is this rate determined? It is estimated on the basis of the assumed time since the species diverged, i.e., the claim is assumed proven on the assumption that it is true. Must I accept this kind of reasoning? Is there any reason why God should not have created them in virtually the same form as we see them now? The theory relating to the evolution of humans from their assumed ancestor in common with the chimpanzee requires millions of years of mutation, genetic drift and natural selection prior to the appearance of “modern man.” However, when I consider mutation rates, the “cost” of the substitution of each new mutant gene in a population in terms of the number of “genetic deaths,” the assumed number of mutant gene differences between evolutionary stages, and the population size necessary to accommodate such a large number of successive mutations, I find that there is a remarkable lack of evidence for the “evolution of man.” My reasons are as follows. Haldane3 considered this kind of information and came to the conclusion that the number of genetic deaths needed to secure the substitution of one gene for another by natural selection is in the region of 30 times the number of individuals in a generation.4 Using this figure, the cost of substituting 5,000 successive, independent mutant genes in a population of constant size can be calculated. On the basis of an average mutation rate of 10-6, the size of the population must be at least in the order of one million. This implies some 150,000,000,000 forerunners of “modern man,” forerunners who are often represented as belonging to small groups of cave-dwelling hunters called australopithecines who roamed the African savannah. Why is there such a shortage of evidence in the form of fossils, tools, or whatever, for the existence of such vast numbers of australopithecine-like prehumans? It could, of course, be argued that such vast numbers of individuals were spread over millions of years, but I find difficulty with this when I look not only at the lack of evidence, but at the reality of total population numbers. According to the 23rd General Population Conference in Beijing in 1997, the total human population of the earth in that year was assessed to be in the region of 6,000 million, showing that there has been a remarkable increase over the past 200 years. Estimates of the population numbers back to the year 1500 and a prediction for the year 2080 are given in the following table. I find these figures to be in close agreement with what one would expect from the biblical specification after the Flood in 2344 B.C. The assumed existence of thousands of millions of “prehumans” is both physically and scriptural unrealistic. 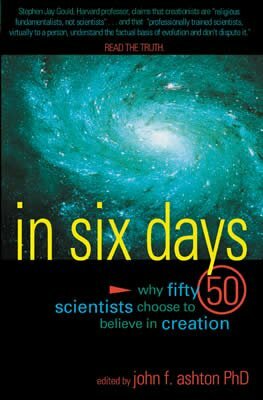 I must admit that the six days of the creation presented some difficulty for me. The apparent logic of conclusions from observations and measurements in various fields of science had previously led me to doubt the little I had known of the Word of God, to the extent that I had agreed with attempts to replace it with an alternative concept of time. But God does not say eons or years or months or weeks—He says days, and we generally understand days to be 24-hour periods. I then realized that had God wanted to say a billion years rather than six days, He could have said it, very simply, in the way He spoke to Abraham: “ I will make your offspring like the dust of the earth, so that if anyone could count the dust, then your offspring could be counted ” ( Gen. 13:16 ). In the same way He could have said, “I took as many years as there are particles of dust on the earth to create the heavens, the earth, the seas, and all that is in them” and it would have sounded very impressive but He said six days. Would He have said this if it were of no concern? It is also clear to me that if one wishes to believe in the theory of evolution, a great deal of Scripture, including Jesus’ own spoken word ( Matt.19:4, 25:34 ; Mark 13:19 ; John 5:46–47 ), has to be discounted. So, whom must we believe, God or man? I believe that God gives us the answer when He says, “ Stop trusting in man, who has but a breath in his nostrils. Of what account is he? ” ( Isa.2:22 ). Data from Charlotte J. Avers, Genetics, Van Nostrand, New York, Fig. 16.12, 1980. Robert F. Weaver and Philip W. Hedrick, Genetics, Wm. C. Brown Publishers, Dubuque, IA, 1989. J.B.S. Haldane, The Cost of Natural Selection, J. Genet 55:511–24, 1957. See also J.F. Crow and M. Kimura, An Introduction to Population Genetics Theory, Harper and Row Publishers, New York, Section 5.12, 1970.